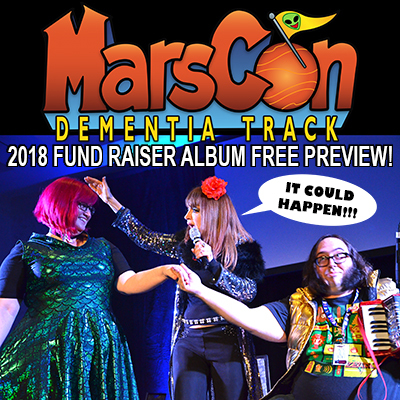 This is not a regular episode of Bad Rapport, this is a commercial for MarsCon 2018 and this year’s Dementia Track Fund Raiser MP3 album, which you can purchase at MarsCon Dementia dot com at the ‘Shop’ page. 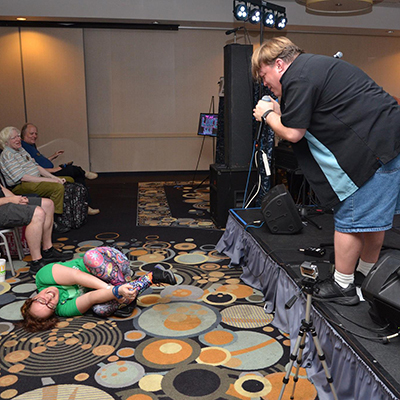 It’s only $20 for this nearly 4-hour long MP3 collection of comedy music concert tracks recorded live at MarsCon 2018! It’s also worth pointing out that you can also buy previous year’s live concert MP3 collections, each nearly 4-hours long, dating all the way back to 2007, for just $20 each. Or, you can get ALL 13 COLLECTIONS, which is over 46 hours of live comedy music, for just $100 (only 42% the regular cost! For that, visit the ‘Past Fundraisers’ page of MarsCon Dementia .com. Another 6-and-a-half months, another episode, and in that time yet another visit to California for Carrie and Alex to see a very special Aquabats concert. Per usual, we do our best to hit the highlights of our lives since we last posted an episode, and fill you in on some of the changes in our personal lives that has made making time to record these episodes even harder recently. This one’s just under 3 hours, with a pretty even split between talking (including plugging stuff and reading your comments) and playing comedy tracks for you all, finishing off with a bunch of funny holiday music! This episode’s comedy tracks are by Cheech Marin, “Weird Al” Yankovic, Monty Python, Moneyshot Cosmonauts, Schaffer The Darklord, the great Luke Ski, Carrie Dahlby, Cirque du So What?, Devo Spice, the Incredibles, Will Arnett, The Aquabats, Alex Rasey, TV’s Kyle, The Arrogant Worms, Paul & Storm, Princess Rap Battles (Whitney Avalon), Art Paul Schlosser, Epic Rap Battles Of History, MC Frontalot, Kyle Kinane, Rachel Bloom, Paul F. Tompkins, brentalfloss, Chris Pine, Shameik Moore, William Shatner, Henry Rollins, The Nick Atoms, Steve Goodie, The Doubleclicks, Fortress Of Attitude, and Lauren Mayer. We wish you all a merry, happy, joyous life, no matter what time of year it is. Please leave us some comments, and we’ll try to answer them in a new episode that we’ll make as soon as we can. Peace and love to you all! This is not a regular episode of Bad Rapport, this is a commercial for MarsCon 2018 and this year’s Dementia Track Fund Raiser MP3 album, which you can purchase at MarsCon Dementia dot com. 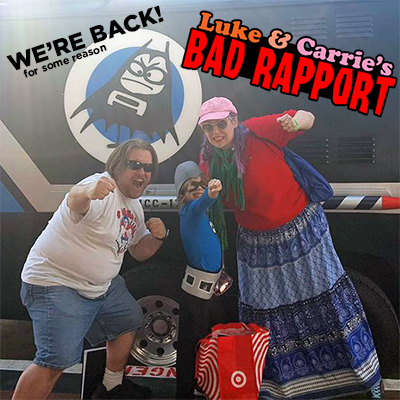 Life has been so crazy for Luke and Carrie the past 2 months, that they don’t even have the time to talk about it right now. So after a brief intro, we get right into playing some holiday comedy music tracks by Neil Patrick Harris, TV’s Kyle, featuring the great Luke Ski and John Berry, Mr.B The Gentleman Rhymer, The Library Bards, The Toy Dolls, MC Lars, Garfunkel & Oates, Schaffer The Darklord with BB Heart, Devo Spice, Paul & Storm, and The Aquabats! 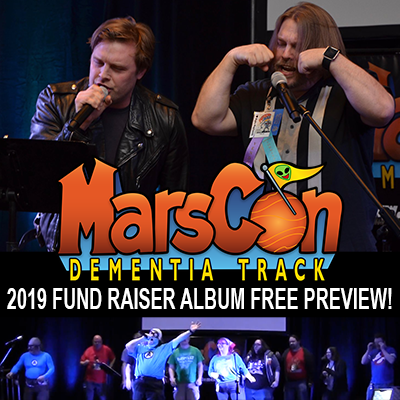 Coming soon: the MarsCon 2018 Dementia Track Fund Raiser Free Preview episode! Happy Halloween! 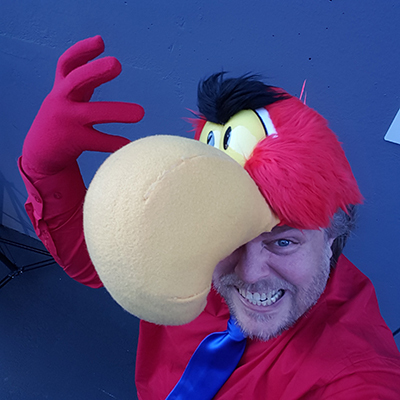 In this episode we talk about our Halloween costumes for this year, including this amazing Iago hat made by Lindsay Smith! We also dive into the amazing crazy musical world of The Aquabats! They’re Carrie and Alex’s new favorite band, and Luke went to see them in concert. Carrie also does a brief report on OVFF and Alex’s Alexa shenannigans, and Luke talks about the stuff he’s been up to per usual. And hey, this episode is only 1 hour and 43 minutes, our shortest episode in a very long time! That leaves you more time for trick or treating! Cool! This episode’s comedy & music tracks are by The Aquabats!, Devo Spice, TV’s Kyle, MC Cool Whip featuring Schaffer The Darklord, Professor Elemental, Tom Smith, Paul & Storm, & Scooter Picnic. And I’m only now realizing I forgot to do the “What’s at the FuMP?” segment during plug time, so, uh, go see what’s at the FuMP yourself at www.TheFuMP.com! In this episode we recap FuMPFeST 2017, including playing the demo versions of 5 of Luke Ski’s new “Dumb Parody Ideas” interstitial tracks, as well as an audio clip of a woman named after a lumber fastener in the midst of a hysterical fit (see attached pic). 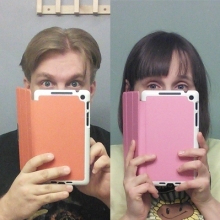 Then Luke and Carrie take turns recapping some highlights of other stuff they’ve been up to in 2017 besides MarsCon, the Rasey’s L.A. Visit, and FuMPFeST. We even actually get around to reviewing a piece of media, the movie “The Big Sick” starring Kumail Nanjiani. This episode’s comedy & music tracks are by Worm Quartet, brentalfloss, Epic Rap Battles Of History, Game Grumps & Master Sword and Em-One, 2d6 featuring Detox The Kid, the great Luke Ski, Scooter Picnic, Insane Ian, Richard Cheese, Kobi LaCroix, The Sockapellas, Ookla The Mok, MST3K, Schaffer The Darklord, Henry Rollins, Megathruster, How I Met Your Mother, “Weird Al” Yankovic, Garfunkel And Oates, The Four Postmen, Whimsical Will, & Tenacious D.
Just what is “The Chicken Game” you ask? Why, it’s the new game invented by Alex Rasey which will soon be sweeping the nation! 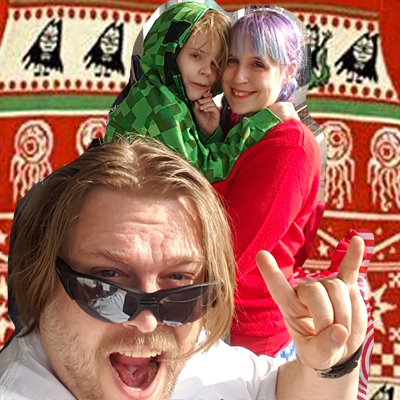 To learn the complex rules of this intricate and nuanced game, you’ll have to listen to this Bad Rapport episode in which Carrie and I recap the Rasey family’s visit to California over Memorial Day weekend! 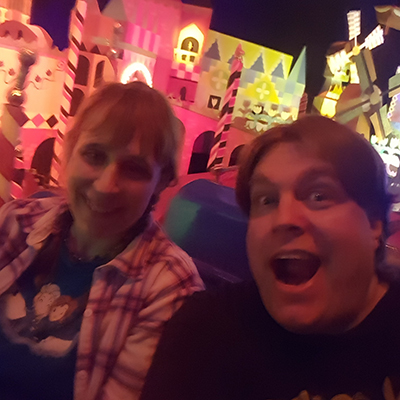 From Newport Beach, home of the most treacherous sidewalks west of the Mississippi, to Disneyland, to Santa Monica Pier, we recap it all just for the 32 of you! We also read your comments, and Luke does the longest “What’s Luke Plugging Now?” segment in recent history. This episode’s comedy & music tracks are by The Book Of Mormon, Devo Spice, TV’s Kyle, Klopfenpop featuring MC 117 & Milk-Plus & Diabeats, Da Yoopers, Epic Rap Battles Of History, the great Luke Ski featuring Bonnie Gordon & Carrie Dahlby, The Axis Of Awesome, Bart Morgan, Samus, D-Metal Stars, Power Salad, & The Lonely Island. The title pretty much says it all. 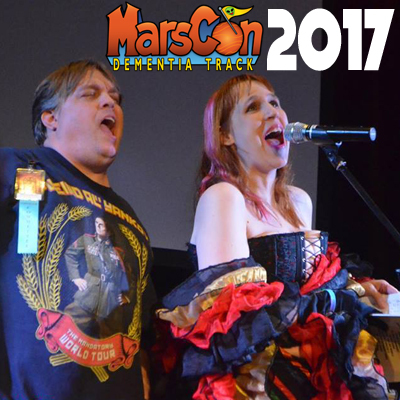 It’s time for our yearly look back at all the stuff that went down almost 2 months ago at MarsCon 2017. Overall, it was an amazing, great, fun time, and I could type more, but why should I because you’re going to listen to us talk about it anyway so I’ll stop. This episode’s comedy & music tracks are by Mystery Science Theater 3000, Art Paul Schlosser, Richard Cheese, Devo Spice, Cirque du So What?, The Lonely Island featuring Michael Bolton, the great Luke Ski, Charlotte’s Web, Scooter Picnic featuring Lindsay Smith, The Side Quest, Jemaine Clement, Tony Goldmark, Mikey Mason, “Weird Al” Yankovic, TV’s Kyle, Epic Rap Battles Of History, T.J. Miller, Kobi LaCroix, GLaDOS, Nuclear Bubble Wrap, and MC117 featuring Klopfenpop. Tune in next time when Luke and Carrie will talk about non-MarsCon things. But until then, enjoy our annual wrap-up! Three months have gone by since the last full episode has posted, the timing of which means that (besides promotional episode #127.5), we went completely through MarsCon season with out me posting an episode. In fact, Carrie and I finished recording all the segments of this episode 7 weeks ago (before MarsCon 2017), and I am only now getting around to editing and posting it for you all. I apologize for the delay, but hopefully this is an indication of how busy I’ve been lately between creating the MarsCon Dementia Track and my day job making the best cartoon show ever “Mighty MagiSwords”. 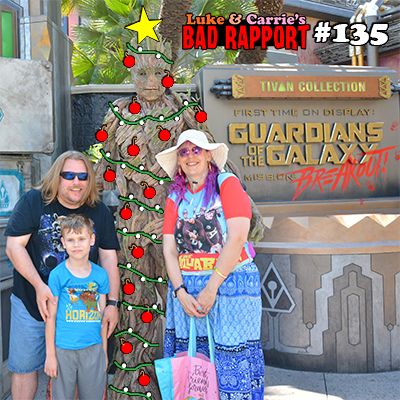 In this episode we recap our 2016-to-2017 holiday season experiences, Luke’s visits to the Midwest and Carrie’s visit to the hospital. 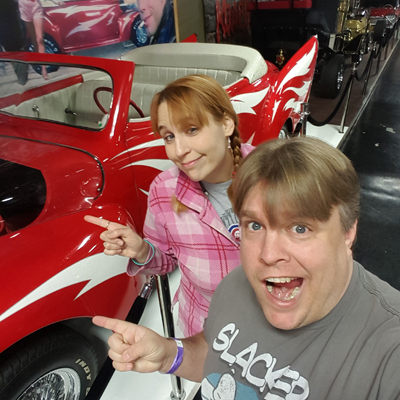 We also went to the Volo Auto Museum where we got a picture with a replica of “Greased Lightning” because “Grease Wars”. Speaking of fast cars, Luke is very excited that there’s a new arcade game in the “Cruis’n” franshise. This episode’s comedy & music tracks are by The FuMP, The Gregory Brothers, “The Lego Batman Movie”, Insane Ian, “The Flash” & “Supergirl”, Tony Goldmark, the great Luke Ski, “Tangled”, “Moana”, “Beauty And The Beast”, StarF, Devo Spice, Da Vinci’s Notebook, The Library Bards, and Power Salad.